The system, created at MIT, can deliver medication directly to areas of the brain as small as one cubic millimeter. Researchers from MIT have created a system that can deliver medicine directly to areas of the brain as small as one cubic millimeter. Using a needle the size of a human hair, the system could make it possible to directly treat diseases affecting the brain through specific circuits or regions without injuring or interacting with other nearby areas. The study has been published in the journal Science Translational Medicine. 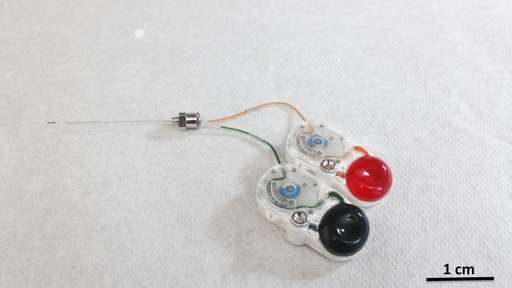 The ultra-thin needle contains tubes that can deliver drugs deep into the brain. All of the components used are very fine, which gives the doctor performing the procedure as much control as possible in terms of placement and depth of the needle, as well as how much medication is dispensed. The researchers tested the technology on rats and were successfully able to deliver a dose of medication to a specific region of the brain that affected the rat’s motor function. “We can infuse very small amounts of multiple drugs compared to what we can do intravenously or orally, and also manipulate behavioral changes through drug infusion,” Canan Dagdeviren, an Assistant Professor at MIT and lead author of the paper, said in MIT’s press release. The MIT researchers were not only able to successfully administer drugs to extremely specific locations, they were also able to inject a separate dose of saline to wash the drug away, which gave them maximum control when it came to dosing. The ability to directly administer drugs to the brain could not only lead to new treatments but markedly improve existing ones. Many drugs currently used to treat brain disorders and disease often come with a host of side effects, largely because the drugs can affect regions of the brain other than what the drug was designed to treat.